Remember last week when we promised to introduce you to a young lady who has found her calling? Well, Parental Unit and I were able to interview our friend, Meg just yesterday, and we're thrilled to bring you excerpts from that interview today. Meg is the daughter of one of Parental Unit's friends, who we know to be a long-time animal lover. And we also know that Meg has been shadowing a veterinarian, her chosen career, for over four years. Now get this: Meg just turned twelve, so that means she's been shadowing this vet since she was about seven or eight years old. (Parental Unit says she could probably say "Hello" pretty well at that age, but that's about it). So here's what Meg has to say about helping animals in need, her chosen career...and a new addition to their household this spring. Parental Unit: So Meg, I hear you did something pretty special for your birthday celebration this year. Meg: I invited a few friends over for a party and decided to ask them to bring a small donation to the American Humane Society instead of bringing presents for me. Parental Unit: We think that's pretty nice of you, Meg! How much were you able to donate? Meg: We donated $250 to the Humane Society. Bocci: Whoa! $250 bucks! What a lotta loot for treats nice sum of money to donate. I'm sure they'll appreciate it. Parental Unit: What did your friends say about your unusual birthday request? Meg: My friends thought it was a great idea-they were excited to give! Parental Unit: I know that you want to be a veterinarian, and you've been shadowing a vet for quite a few years, Meg. What exactly do you do when you visit the clinic? Meg: I go with the veterinarian and her staff when she sees each patient, help out when I'm asked, and usually just listen and learn a lot from the experience. I also get to observe during surgeries, "I don't get freaked out by blood and all that other stuff." Bocci: Blood? I'm starting to feel woozy...clunk! Parental Unit: Just ignore Bocci, he'll be fine. 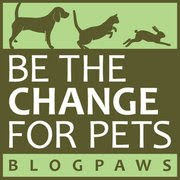 Do you plan to help out any other animal organizations in the future? Meg: I have a good friend who's interested in helping animals, too, and right now we're doing some research on puppy mills. We'll probably write letters [to raise awareness] when we get more information. And we're looking into more ways to raise money-we're probably going to expand into [more formal] fundraisers soon. Bocci: O.K. I'm feeling better now-just had some water and a biscuit to normalize my blood sugar. Great about that fundraising thing, Meg. Just let me know when you get more loot money to donate. 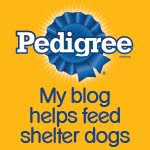 I've got just the dog treats to buy animal organization that would be grateful for your donation. Speaking of dogs, I hear you've got plans for a new addition to your household! Meg: Yes, Bocci, this spring we're looking forward to bringing home a Wired Hair Pointing Griffon puppy! Parental Unit: That's exciting, we'll look forward to visiting and taking lots of pictures! Bocci: Oh boy, I can hardly wait to meet the little rascal! I'll be happy to pass on all the ways I've learned to avoid getting caught doing something bad to strictly obey all of Parental Unit's commands. P.S. Parental Unit and I can't help but wonder how many animals in need or other causes could benefit if more young folks would ask for a "donation to a charity or cause instead of presents" for just one birthday... We love this idea! A hearty "thank-you" to Meg and her family for allowing us to publish this inspiring interview. 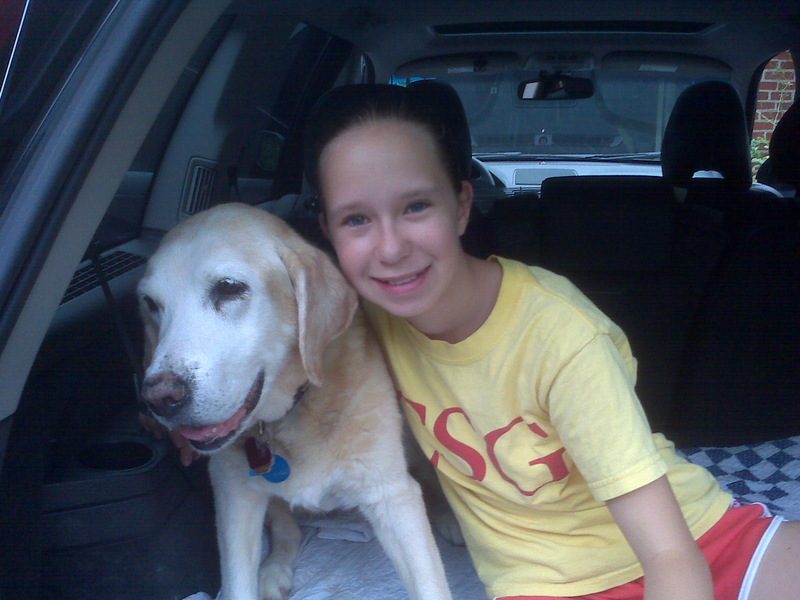 We'll leave you with a picture of Meg and her late dog, Kelley, whom they lost to old age last year. Paws up to Meg! Wish there are more children like her and they could even teach the adults a thing or two. It's so nice to meet Meg... she's awesome! What a wonderful little girl! What an amazing girl! Loved her birthday present idea! If she's located here in town, I'd love to participate in fundraisers, could use my camera and do portraits benefiting a shelter! My previous B&B - aka The York County SPCA - often features human puppies that do this kind of pawesome thing fur their Gotcha Days! We need more like her AND less like 'him' - if woo know who I mean! Thanks fur sharing her and her special Rainbow Bridge furiend! Meg is my granddaughter and I love her and am so proud of her. I know she is proud of herself which is the important thing. She has loved dogs/animals as long as I can remember and her birthday idea of donating was amazing. I think that even at her young age, she will continue her interest in helping animals. She is certainly pursuing her dream and with her determination and courage, I believe she will live out that dream. Thanks so much for taking the time to comment, Meg's grandmother! I have no doubt that I will one day take my pets to Meg's veterinary clinic! Bocci, great interview, and Meg did a lovely thing for her Birthday. Hi! I'm following you on Making Friends Monday. Love your blog! I can relate to the "Stuff I've Ruined"... my dog loves to see how many things he can steal and bury! How special that little Meg is! Bocci I hope your Mom had smelling salts! Yeah for Meg. My mom and I have an very important young dog lover in our life too Bocci. Her name is Emily and is almost 12 too! Thank goodness for young kids who have hearts to help all us animals! Very nice and helpful blog.